Last week, Centerplate’s board of directors put Hague on probation, but didn’t fire him — despite growing outrage and boycotts of Centerplate food, which is sold in many major sports venues. Today Joe O’Donnell, chairman of the board, released a statement saying Hague has quit as head of the multibillion-dollar company. Last week, per the board of directors’ request, Hague agreed to donate $100,000 to establish a “Sade Foundation,” named after the puppy he kicked, to protect animals in Vancouver, where the kicking took place. Hague was also asked to complete 1,000 hours of community service for an animal-welfare organization and to attend anger-management sessions. 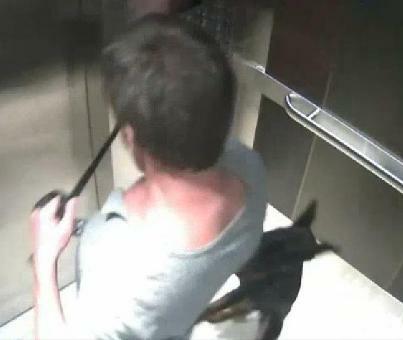 In the video, taken inside an elevator July 27 at the upscale Private Residences at Hotel Georgia, Hague can be seen repeatedly kicking the puppy’s stomach, and then choking her by yanking up her leash and suspending her in the air. As news of the case spread, hundreds of people condemned the puppy-kicking CEO on social media using the hashtags #DesHague and #BoycottCenterplate. Here’s the surveillance video showing Hague as he lost control of his emotional response. The case is still under investigation by the BC SPCA, and Hague may very likely face criminal animal-abuse charges.